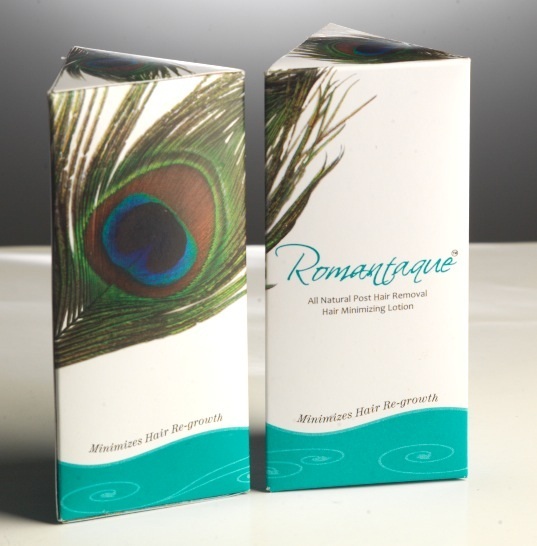 PR update: Romantaque Post hair removal hair minimizer. Romantaque is an innovation company, based in Pune, India. This post is about their novel product that arrests regrowth of hair, which can be used after hair removal by waxing, threading. About “Post hair removal hair minimizer” :- This is a hair growth inhibitor. As a precondition, after hair removal the skin has to be ‘normal and intact’ recommended hair removal is by TWEP approach (Tweezing, Waxing, Epilation, and Plucking). Hair should be pulled out from follicle, 24 hours in advance before Romantaque is applied for 10 days – twice a day. The nano-tech enabled active affects the hair follicle function, in terms of weakening in strength, lightening in color, reducing the speed of next hair . Repeated applications give a perceptible change, for the user – in reduced pain and lesser hair growth and density for a close observer like personal aesthetician as well. This nano-tech powered cosmetic version is developed with support by Government of India – under TePP program in collaboration with IIT – Bombay and has been awarded in 2011, by DST Lockheed Martin India Innovation Growth Program as well. Clip sponsored by FICCI and hosted at YouTube is attached here with http://www.youtube.com/watch?v=gcEQFbN0Khofor your quick reference. Do give this a try and Happy hair riddance. P.S. Product info sent by brand PR. < Previous REVIEW: L’Oreal Paris Casting Crème Gloss : Iced Chocolate.